I am going to use the same yarn and colour as in the pattern, Shelter by Brooklyn Tweed in Fossil. You can probably tell by the title of the post that there is a joke (of sorts) involved here. First, I will explain what a swatch is and why you need it, then I will provide a set-up and the punchline. Now, we all know that in order to get a sweater that fits, you have to have the right gauge. The sweater is designed to a particular gauge – that is, it is designed so that x number of stitches and x number of rows measure out to a given size. Traditionally gauges are given for a square measuring 4″ (10cm). Exeter is designed for a gauge of 20×28; this means that a 4″ square section of fabric will have 20 stitches across and 28 rows. Normally a gauge will be given for stockinette stitch, but might be given in a pattern stitch. Gauge is nearly always determined based on a washed and blocked sample. Since different knitters knit with different tensions, the only way to make sure your sweater fits as the designer intended is to knit up a sample (called a swatch) on a particular size knitting needle, then wash and block it, let it dry and measure it carefully. If your gauge is too narrow (ie, more stitches or rows than called for) then you must knit another swatch with a larger size needle (ie, a needle with a bigger width). If your gauge is too wide (ie, less stitches or rows than called for) than you must try again with a smaller sized needle. Each of these measurements must be taken on a swatch that has been washed and blocked and dried. Now we come to an interesting problem. Sometimes, you need to knit quite a few swatches before you hit the right gauge. Notice that the most important element of the swatch is to identify it with the needle size it was knit with. While the swatch is on your needle, it is easy to tell what needle size the swatch represents. Once you take it off the needle, the problems begin. Let’s say that you end up knitting 4 swatches, one each with a US size 4,5,6, and 7. Now, you throw them all in the basin, soak them, blot them between towels, block them, let them air dry and then carefully measure. And you’re in luck – one of them exactly matches the gauge! Yes! But which one was it? Is this the swatch you knit with the size 5 needle? Or, perhaps, you somehow mixed them up in the process…. Now, when one is faced with a knitting dilemma, the answer can usually be found on Ravelry. A few months ago, I was reading a thread in which a knitter was addressing this very problem. She said that she had been taught a great tip by the knitting designer Ysolda Teague. Ysolda told her to knit the needle size into the swatch. Let’s say that you were knitting a swatch in stockinette stitch. You knit a series of purl bumps into a corner of the swatch – one bump for each size. (Separate them out with a knit stich in between to make them easy to count.) Thus, if you are swatching with a size 5 needle, you will knit 5 purl bumps into the right side of the fabric. You will then know exactly what size needle you knit the swatch with, no matter how much time has gone by or how many swatches you’ve knit. (Please note that you need to be consistent with units – either use US sizes or metric sizes consistently. If using metric sizes, you can use a purl bump for each mm, and a yarn over for each 1/4 mm; thus, a 3.5mm needle would need three purl bumps followed by two yarn overs.) Wow! A system! A pretty clever system at that! I knit the first swatch for Exeter using a US size 7 needle. I carefully (and very smugly) knit a series of seven purl bumps in one corner of the swatch. Even before washing it, I could tell tell that I would need to try a larger needle, so I went to my box of needles to pull out a size 8 needle to knit the next swatch. I was feeling very pleased with myself and my new system. Never again would I be stuck not knowing which swatch was knit with which needle. I use circular knitting needles almost exclusively. Unlike straight needles, which usually have the needle size printed on the cap, for the majority of circular needles the only way to tell the size of the needle is to use a needle gauge. 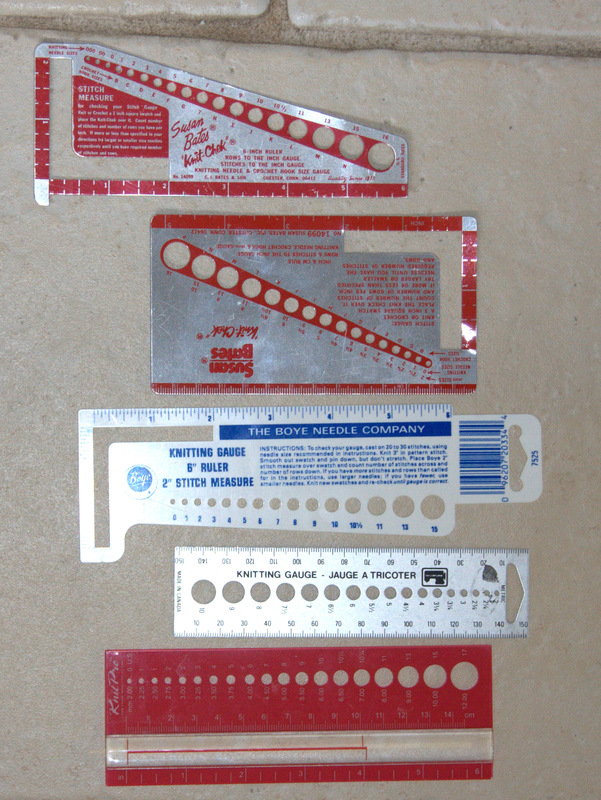 A needle gauge is a tool which has labelled holes in it of different sizes. A size 6 needle will fit into the hole marked size 6, but will not fit into the hole marked size 5. I am always losing my needle gauges. They are never where I need them to be. My solution is to have lots of them. I try to always keep one in the box with my circular needles, and one in the box with my DPNs, and one in my knitting notions kit, and one in each project bag. I opened up the box with my circular needles, reached for the needle gauge and found a size 8 needle. I grabbed both the needle and the gauge and ran upstairs to knit. This is an ancient needle, you can see that the blue enamel is wearing off. I have no idea how old it is or which make it is. 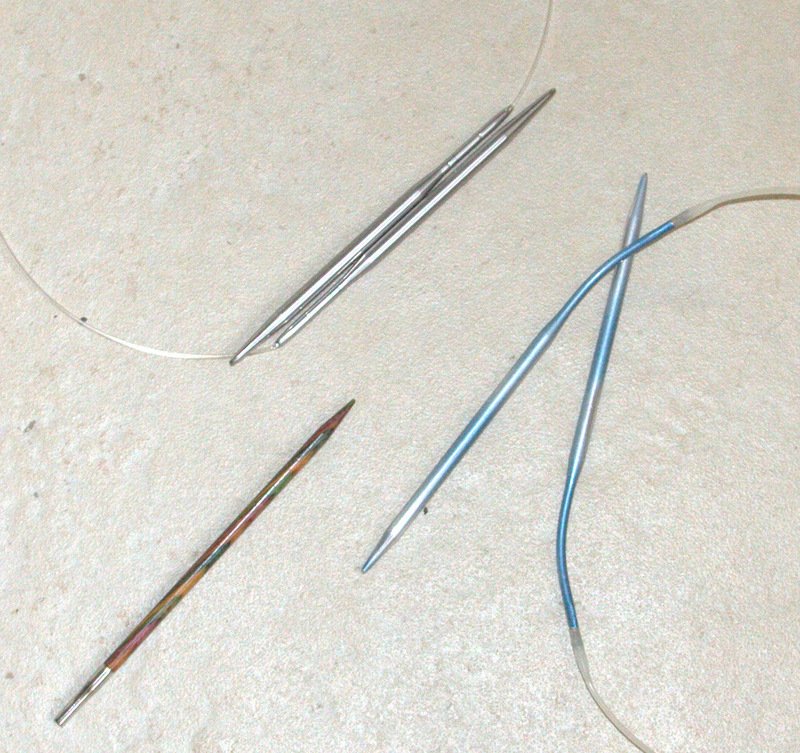 However, this needle registers as a size 6 on the top three needle gauges and a size 7 on the bottom two. Could it be that the US -produced needle gauges use slightly different measurements? To check, I grabbed the needle on the top left of the photo. This is a fairly new HiyaHiya interchangeable needle, which is still clearly stamped “US size 7, 4.5mm”. I checked this needle against all of the gauges and it clearly registers as a 7 on all of the gauges. So, perhaps this is a problem with the blue needle. It is old, and possible worn. I decided to check another new needle, the interchangeable KnitPro needle tip on the bottom left. It registers as a size 6 on all of the gauges, except the Boye gauge, on which it is a size 5. This divides the gauges along a different line than the blue needle. Now, I start to pull my hair out. Clearly, THE JOKE IS ON ME! Here I am, smug as can be because I have found a fool-proof solution to figuring out which swatch was knit on which size needle. But, it turns out, I have no idea which needle is which in the first place! My seven purl bumps on the bottom of the swatch are rendered meaningless. As an afterward: I poured this whole sorry tale out to Doug. His solution: he went online and ordered me a micrometer, a precision instrument for measuring the diameter of a round object. I throw myself on the mercy of the engineers.